We have contractors and pretty nice guys they are, too. 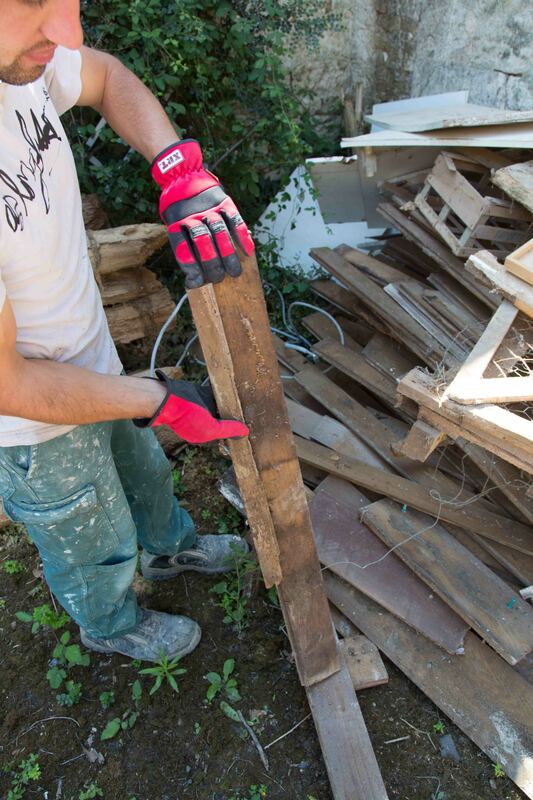 Here is one of them, holding up a piece of oak flooring that he has removed from the former dining room. When I squealed “You’re not saving that?? ?” he did not groan and say “Lady, knock it off.” He explained why. After some 180 years, those floor boards, thick oaken beauties that they are, had become worm eaten and were no longer usable. He showed me the worm holes. I thought about pointing out that folks pay good money to have worm holes put into their furniture but then I thought nah, these guys like old stuff. If it could be used, they would keep it. I deferred to their expertise. So we shall see. For now, I’m just glad to see someone on site. How bad is the worm? Wish we were nearer you, I would be round there sorting through the good wood and offloading to top up renovation funds. Then again I am compulsive salvager.It is a lot of hassle sorting the gold from the dross though…………. Some of those boards are crumbling to dust. Others look like they just have cosmetic damage. If I had a specific use for them, I’d sort through and put the good ones aside. As it is, I figure my English contractor started as a cabinetmaker and he likes old stuff. If he says they are not worth saving, maybe they are not. But sure, if you were passing through, you would be more than welcome to take a look.